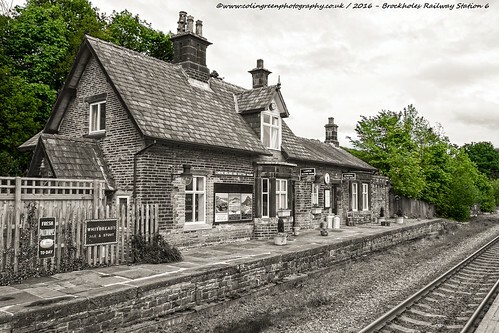 Colin Green Photography: Brockholes Railway Station, West Yorkshire. 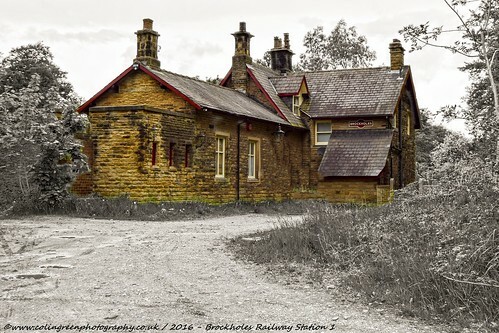 Brockholes Railway Station, West Yorkshire. Brockholes Railway Station serves the village of Brockholes, Approx. 4 miles to the south of Huddersfield, West Yorkshire on the Penistone Line. The station opened in 1850 and was the junction for the Holmfirth Branch Line which also opened on the same day. 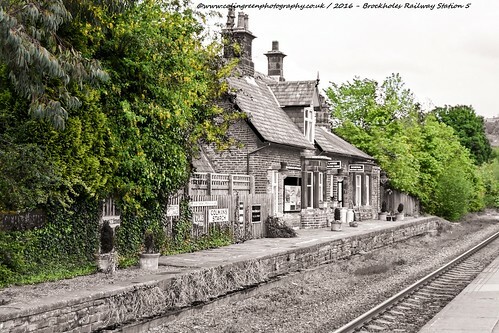 The station was known as Brockholes Junction for a time during the 19th century but had long since returned to Brockholes by the time of the Holmfirth Branch Lines closure 1959. The Beeching report in 1963 had marked the line and station for closure. In April 1966 the Ministry of Transport refused the closure of the line but due to goods traffic having ended in 1965 the station became an unmanned halt 4 months later. Some of the station buildings were demolished during the 1970's and the Station Masters house and offices on the up platform were sold in to private ownership. Again closure of the line was discussed during the 1980's. Arrangements were made in 1987 to keep the line open and the double track was reduced to a single line in 1989 with only the down platform still in use. The station now offers limited facilities with a small shelter on the in use platform. The disused platform and buildings have been restored complete with heritage signage. It currently handles approx. 60000 passengers annually. There are 7 pictures to view taken at the station on May 21 2016 using a Nikon d3300 SLR camera. 6 can be seen on Flickr with 1 exclusive to Clickasnap via the link and 5 available on both platforms. The restored former station house and offices. This can also be seen on Clickasnap by clicking here. This picture can also be seen on Clickasnap by clicking here. There is also a colour version of this picture on Clickasnap. The following links take you to the remaining Clickasnap pictures. They all open in another window. The picture shows the restored former station buildings in colour with the heritage signage. 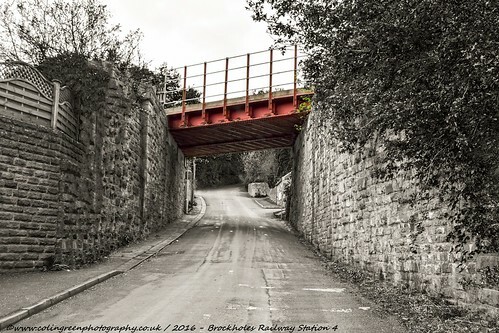 A partial black and white picture with the track bed still in colour. Shows the railway heading in the direction of Huddersfield taken from the in use platform. Taken from the end of the in use platform in the direction of Penistone looking across both the closed and open parts of the station. The World's largest free to use, paid per view, image sharing site.